Looking for a fun children’s activity or event? How about a fantastic birthday party, school activity or family event? Look no further than Science Boffins! Our Science Boffins present amazing science parties for children which include jaw dropping scientific experiments, mind blowing demonstrations and entertaining games, specifically created to give your children an unforgettable party and take away the hassle and stress from you. We cover all of the UK and will travel to your choice of location, then sit back and enjoy the entertainment too! How much is a Science party? Children’s science parties can start from approximately £10 per child (price guide based on a party of 15-30 children), which includes free invites, thank-you notes, certificates and a free Lab Apprentice Kit for each birthday child! Each party booked includes a complimentary lab coat, certificate, badge and balloons for the birthday child. If there is more than one birthday child, all the birthday children will get their own Laboratory Apprentice Kit. Booking Science Boffins for a children’s party or activity couldn’t be easier. Simply call us on 020 8953 5566 or fill out the enquiry form and we can talk through your individual requirements and check availability. 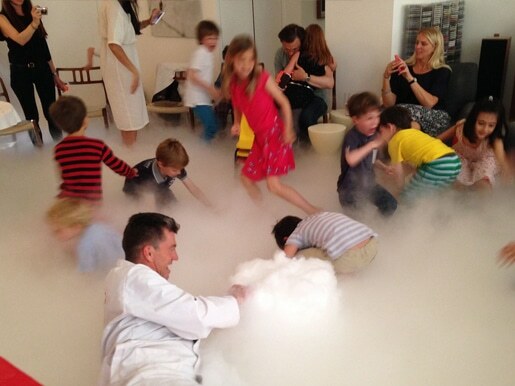 Once your party has been booked we will work with you to ensure that your science party is unforgettable!